IS THIS THE BEGINNING OF THE END OF MALAYSIAKINI IN ITS PRESENT FORM? The claimants say that the compilation of readers’ comments in two ‘Yoursay’ articles published on May 14, namely ‘A case of the PM reaping what he sows’ and ‘How much will Najib spend to keep Terengganu?’, were defamatory. Case management is set for June 18 before justice SM Komathy Suppiah. “He was more than welcome to explain to them why he thought their opinions of him and Umno were wrong,” said Gan. “We intend to fight the suit vigorously,” added Gan. “Due to this, the only thing left to be said is, ‘Dear prime minister, see you in court’. PM Najib: I want to be very clear. This does not indicate any wider agenda. It is not part of any crackdown. It is not an attempt to silence critical voicesReally? Not an attempt to silence critical voices? Malaysiakini has refuted reports by the Umno-owned media that the news portal had refused to accept a legal notice relating to alleged defamation against Prime Minister Najib Abdul Razak and Umno. The news portal was on Thursday served with a letter of demand by Najib and Umno through law firm Hafarizam Wan & Aisha Mubarak concerning comments made by six Malaysiakini readers that appeared in two ‘Yoursay’ articles published by the website. 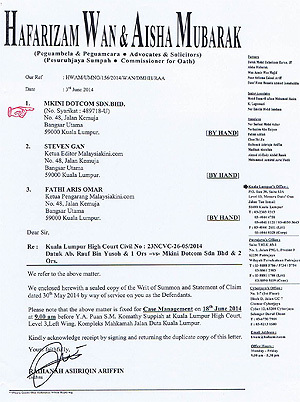 The law firm’s representative Raihanah Ariffin was later quoted by Umno Online as accusing Malaysiakini of compiling defamatory and seditious comments and had initially vehemently refused to accept (berkeras tidak mahu menerima) the legal notice when served at its office in Bangsar Utama. Malaysiakini editor-in-chief Steven Gan (left) said Raihanah’s claims were completely untrue and that the website has raised this matter in its official response to the letter of demand, which was delivered to Najib’s law firm yesterday. “Our legal affairs manager, on meeting Raihanah, asked her wait for a while so that the letter of demand could be shown to the relevant people it was addressed to,” said Gan. “After requesting Raihanah to take a seat at the office reception, our legal affairs manager went upstairs where the newsroom is located to inform both Fathi and I.
Gan said it is ironic that such an allegation came from the law firm which is representing clients who are accusing Malaysiakini of publishing defamatory statements. Raihanah’s defamatory remarks were today reproduced in Umno-owned Utusan Malaysia, while Umno-linked Berita Harian used the same quotes, but attributed them to Hafarizam Wan & Aisha Mubarak. Prime Minister Najib Razak has threatened to sue Malaysiakini for the news portal’s publication of its readers’ comments concerning his handling of the political crisis in Terengganu which erupted early this week. Najib’s legal action was initiated in his personal capacity and jointly with Umno through law firm Hafarizam Wan & Aisha Mubarak. A letter of demand, which was hand-delivered to Malaysiakini late yesterday, claimed the compilation of readers’ comments in two ‘Yoursay’ articles published on May 14, namely ‘A case of the PM reaping what he sows’ and ‘How much will Najib spend to keep Terengganu?’, were defamatory. The letter, signed by prominent Umno lawyer Mohd Hafarizam Harun, said the comments made in particular by six Malaysiakini readers, are also seditious. “All the accusations made by users on Malaysiakini.com were totally baseless, without concrete proof and are very serious, on top of having ill-intent (mala fide) to damage the reputation and image of our clients,” said Mohd Hafarizam. “They, among others, are also intended to lower the honour and credibility of our clients as the backbone of the BN government…,” it said. Najib, who is also Umno president, and his party, are demanding an unconditional apology from Malaysiakini within 48 hours from the issuance of the letter of demand and a retraction of the alleged defamatory articles. Najib and Umno also want Malaysiakini to sign undertakings that the news portal will not publish similar statements which they claim are defamatory and to be careful in publishing readers’ comments which they say are “generally empty accusations and ill-intentioned allegations”. Hafarizam said if Malaysiakini does not respond to these demands, his law firm has received “strict instructions” to initiate court action against the news portal, including filing an injunction to prevent further publication of similar content. In an immediate response, editor-in-chief Steven Gan said the independent news website had expected such action after Umno-owned Utusan Malaysia attacked Malaysiakini readers last month. 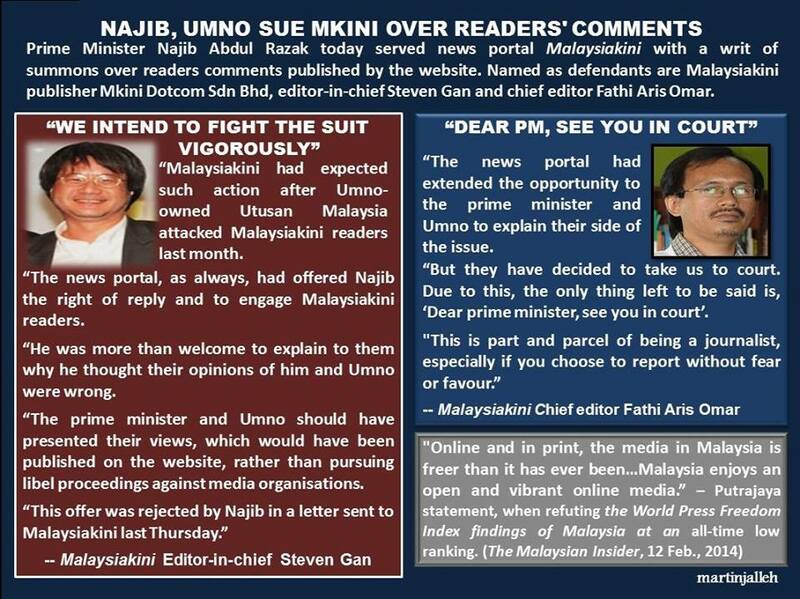 He said the new portal, as always, will offer Najib the right of reply and to engage Malaysiakini readers. “He is more than welcome to explain to them why he thinks their opinions of him and Umno are wrong,” said Gan. He said the prime minister and Umno should present their views, which will be published in Malaysiakini, rather than threatening media organisations with libel proceedings. This entry was posted in Uncategorized and tagged Malaysiakini, Najib Razak, Najib threatens to sue M'kini over readers' comments. Bookmark the permalink.